A popular singer has been arrested for "dabbing" during a concert in south-west Saudi Arabia. Abdallah Al Shahani, a TV host, actor, and Saudi national, was performing the dance move, which involves a person tucking their head into the crook of their arm, at a music festival in the city of Taif at the weekend. Dabbing is banned in the conservative country where authorities consider it a reference to narcotics culture. A video of Mr Al Shahani's dab became popular on social media and thousands have tweeted about the incident. It is thought that dabbing originated in the hip-hop scene in Atlanta, Georgia, US, around two years ago, but gained a global following when celebrities, athletes and politicians including Hillary Clinton and Paul Ryan began performing the move. The Saudi Interior Ministry's National Commission for Combating Drugs recently banned the move because they consider it to refer to marijuana use. 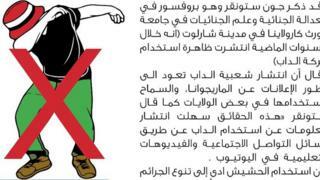 A poster published by the ministry depicting dabbing warns "people about the dangers of this [move] on the youth and society, and is warning against imitating it". It is not clear whether Mr Al Shahani planned to dab or whether he got carried away in the moment as he performed. The singer apologised on Twitter on Tuesday writing, "I apologise to our respected government and to my audience for unintentionally and spontaneously making the dance move at Taif festival. Please accept my apology." Mr Al Shahani's move has divided social media. Commenting on the audible voices of women in a video of Mr Al Shahani's concert, journalist Ayed Al Ayed tweeted: "Young woman, your screaming continues and I find it very disturbing. Whoever breaks the law gets arrested. Thank you to the security forces." "This move has an obvious negative influence on people. No matter what his explanation is, it's unacceptable," tweeted @brakalhmede. Another user suggested that Mr Al Shahani's behaviour was provocative. "Even though the anti-drug authority banned this move and warned people not to perform it, this contestant is promoting it at a public festival!!! Does he think he's challenging authorities with these actions?" commented @honest_very. But some defended the dab. "I'm sure it was an accident, because I personally know this man and his morals, and he has apologised and shown people that he wasn't aware of the meaning of the move," said TV presenter @Kemmooalharbi. "This was just a spontaneous move, he has since apologised to the country's people and government and you're still holding it against him?" said @TDouHKejhaQbxdu. While @asdasd550909800 suggested: "It's clear that he didn't even know what the move means". However, it isn't the first time a celebrity has dabbed in Saudi Arabia though. Social media users noted singer Rabeh Sager frequently performs the controversial move during his performances.